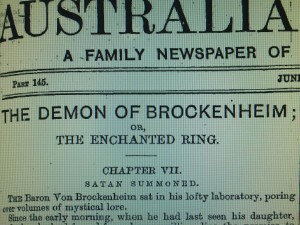 Come and Get The Demon of Brockenheim! Recently Gary Dowell, editor of the wonderful Far Fetched Fables: The Audio Fantasy Fiction Magazine (sibling to StarShipSofa), invited me to contribute a fantasy-related "Looking Back on Genre History" to his podcast. It occurred to me that this was the perfect opportunity to share with everyone an almost-but-not-quite-lost work of epic Gothic fantasy: 1877's The Demon of Brockenheim; or The Enchanted Ring. Today the second part of my two two-part introduction to The Demon of Brockenheim was posted on Far Fetched Fables. You can listen to both parts for free below. And here for your reading pleasure is a free PDF of the novel from its publication in serial form in The Australian Journal: download The Demon of Brockenheim. If you'd like to get your genre geek on a bit more, here are some suggestions. - Anonymous. The Saga of the Volsungs. Jesse Byock, ed. Penguin Classics, 2000. - Doig, James, ed. Australian Gothic : An Anthology of Australian Supernatural Fiction, 1867-1939. Equilibrium Books, 2007. - Ellis, Markman. The History of Gothic Fiction. Edinburgh University Press, 2001. - Fouqué, Baron de la Motte. The Magic Ring. Amy H. Sturgis, ed. Valancourt Books, 2006. - Gelder, Kenneth and Rachael Weaver, eds. The Anthology of Colonial Australian Gothic Fiction. Melbourne University Press, 2007. - Johnson-Woods, Toni. Beyond Ephemera: The Australian Journal (1865-1962) as Fiction Publisher. Diss. University of Queensland, 2000. - Punter. David. The Literature of Terror: A History of Gothic Fictions from 1765 to the Present Day. Volume I: The Gothic Tradition. Longmans, 1980. - Punter, David and Glennis Byron. The Gothic. Blackwell, 2004. - Thomsett, Michael T. The Inquisition: A History. McFarland, 2010. - Tolkien, J.R.R. The Lord of the Rings. Allen & Unwin. 1954, 1955. - Yates, Frances A. The Rosicrucian Enlightenment. Routledge, 2001. I don't suppose it's available in mobi format. I find reading PDFs on my Kindle to be an awkward experience.